6" Water pump. Powered by a 250hp CAT diesel engine. 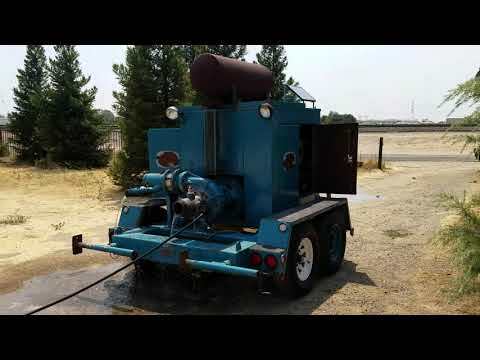 This unit was previously owned by a California municipality and saw very little use. The first scheduled service was completed by the municipality service dept. at 167 hours with full filter and fluid changes. Includes Murphy switch control system (untested), and solar battery charger. Take a look at the pictures and watch the video below for a detail view of pump start up and running (Note: we ran pump with water in chamber so as not to run the seals dry). You are welcome to come personally inspect this item or contact us with any questions. We have successfully shipped equipment to customers around the country and will do our best to find you the lowest cost for delivery. Just call or email for a shipping quote. Note: This pump will ship on a pallet for lower delivery cost. The wheels and axle will be removed for shipping, simply re-install upon delivery. • Brand: Goulds Pump Inc. NOTE: This machine is not for sale in California. Our preferred method of payment is bank wire transfer, although we also accept payment of Cashiers Checks, company check or cash upon pick-up. Items paid for by check will be held until the check clears the bank. We will also accept payment by Paypal and most major credit cards.